Why are there early botanical illustrations? In the approximately 200 years since the early chintzes were printed plant breeders have been busy breeding many garden plants changing them dramatically from their original appearance. The same plants chintz designers saw 200 years ago may only marginally resemble those we know today. 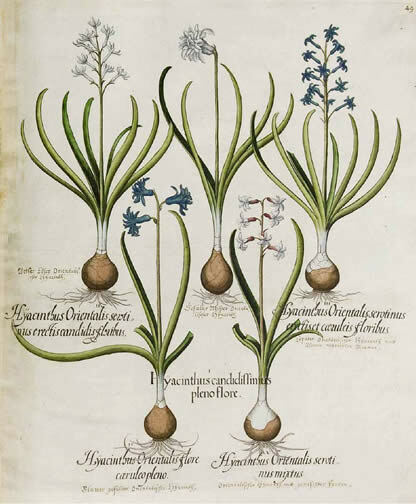 The image on the right is how garden hyacinths (Hyacinthus orientalis) appeared in Basilius Besler's 1613 book Hortus Eystettensis. The image on the far right shows how they appear in today's gardens. Why is the Hortus Kewensis cited? The Hortus Kewensis is regarded by botanists as the ultimate authority for the timing of first cultivation of plants in Europe and Great Britain. Most chintz designers would not have been familiar with plants unless they saw them in gardens or read about them in Hortuses, Floras, nursery catalogs, or gardening magazines. 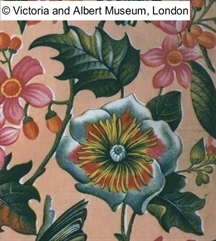 Knowing that a plant was listed in the Hortus Kewensis and thus was known in Europe before a chintz was designed provides one test as to whether we have correctly identified the flower on the chintz. If you are interested in consulting the Hortus Kewensis, check out the Biodiversity Heritage Library website (https://www.biodiversitylibrary.org/) where you can download free copies of all five volumes. It is written in Latin and often uses older scientific names than are currently accepted, so you may need to do a bit of additional research when using it. If I think I know the name of a flower can I look it up? Yes! Check out the "Scientific Name" and "Common Name" navigation button at the top of the page. The links embedded in the names will take you directly to the appropriate page. Only one common name is listed, however, or the list would be too long. Many flowers can share the same common name (think "daisy") and some flowers have a dozen or more common names! Common names can also change over time and across different locations. 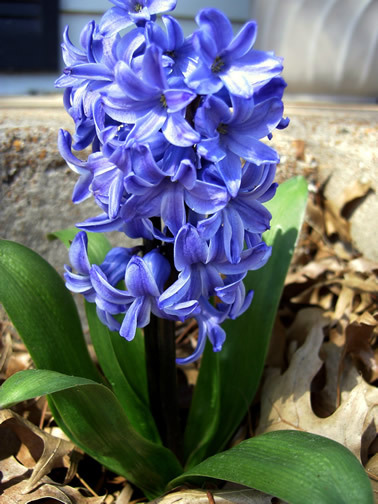 For example, the English flower called a bluebell is Hyacinthoides non-scripta, a member of the Asparagaceae family, while the Scotish flower called a bluebell is Campanula rotundifolia, a member of the Campanulaceae family. Americans call Mertensia virginica, a member of the Boraginaceae family, Virginia bluebell and Australians call Wahlenbergia gloriosa, a member of the Campanulaceae family, Royal Bluebell. Clearly the common name bluebell means different things to different people. At different times and places fashion favors a wide spectrum from quite realistic to very stylized in the depiction of flowers as design motifs. Chintz designers from the last quarter of the 18th century to the third quarter of the 19th century responded to these changes, though during most of this period the floral motifs depicted can be identified as representing real flowers. It is sometimes challenging to making such identifications because textile designers not only have to respect the demands of fashion regarding levels of realism, but they also have to fill space gracefully and make designs repeat so that fabric can be continuously printed in varying lengths. These factors and sometimes the designer's unfamiliarity with the plants in question can lead to a great deal of artistic license. For example, the picture on the far left shows a tulip poplar (Liriodendron tulipifera) flower and leaves as they appear on a chintz from 1834, inspired by Audubon's Birds of America, in the collection of the Victoria & Albert Museum. 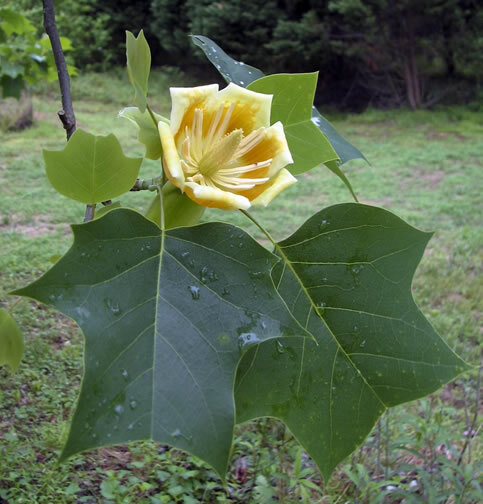 The picture on the near left is a live tulip poplar flower and leaves. By comparing the depiction of the leaves on the chintz to the real leaves it is clear the artist was exercising his artistic license or was not familiar with the real plant.